Fifteen of us left Monocacy Middle School at 11:30 AM: Sara, Vicki, Kathy D., Paul, Cathy F., Andrew, Judy, Ian, Lynne, Jeff, Yvonne, Allen, Bruce, Louanne and myself. Ray joined us in a few minutes. We made our way to the corner of Masser and Mountaindale, turned right and did a loop around Hansonville, Bartgis and Sunday’s. After doing Masser again, we turned on Mountaindale and stopped at the store. We then went up to our spot near the watershed, took our picture and went down and around Putman, Fish Hatchery and Bethel. We tried to get in more downhills on the second part of the ride, since it was hotter. 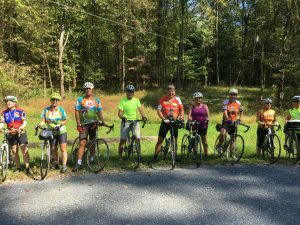 We all had a good time together on our 24 mile ride!